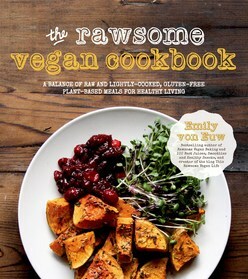 Whether you're a vegetarian, a raw vegan, avoiding dairy, a meat-lover just looking for something new and delicious or you want to lose weight and cleanse, Emily von Euw, author of the bestselling Rawsome Vegan Baking and newly released 100 Best Juices, Smoothies and Healthy Snacks, has creative recipes for savoury, mouthwatering main dishes and meals. Emily's balance of raw and lightly-cooked savoury recipes range from Veggie Wraps with Miso Mustard Gravy to Raw Pizza with Spinach Pesto and Yam Burgers with Daikon Fries and Ketchup. They deliver the comfort and complexity sometimes missed in vegan diets and they're eye catching to boot. Readers will be left feeling stuffed and satisfied. Emily's popular blog, This Rawsome Vegan Life, won the Vegan Woman's Vegan Food Blog Award and was named one of the Top 50 Raw Food Blogs. Her tempting vegan eats paired with her spectacular photography mesmerizes a strong following of more than 86,275 Facebook followers. Healthy raw vegan meals that are creative, comforting, filling and delicious from the author of bestselling Rawsome Vegan Baking.